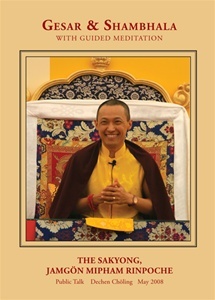 In May 2008, Dechen Choling hosted the Gesar Festival, bringing together His Eminence Namkha Rinpoche, Sakyong Mipham Rinpoche, and Jigme Rinpoche to teach on Gesar and the warriorship principles of Shambhala. In the first talk of the program, offered here on DVD, Sakyong Mipham Rinpoche shows how our particular time is appropriate for the presentation of enlightenment in terms of the warrior principle, embodied in the legendary warrior king, Gesar of Ling. The Sakyong goes on to present the outer and inner aspects of Shambhala warriorship, ending with a guided meditation that emphasizes the practice of riding the life-force energy.